Let’s face it, when it comes to hair removal it’s something that none of us really look forward too and it is usually the last thing on our ‘to-do’ list, so opting for a razor at the last minute before we go out is pretty common. However, relying on this method of hair removal can be doing much more harm than you think. Did you know that 2 billion razors are thrown out every year in America? I know they may seem like very small pieces of plastic that won’t harm the environment much but they can add up very quickly in landfills. 32 percent of plastic products end up in the ocean. IPL home kits, like Selfie Skin are becoming increasingly more popular as solutions around convenience, price, health and environmental impact and show how our product is the better option. Considering that the average person shaves 2 to 3 times per week and a disposable razor lasts for approximately 10 shaves, each person who shaves with disposable razors replaces them about every 5 or 6 weeks. Multiply those numbers by each person of shaving age and several hundred thousand disposable razors get used each year and, most likely, get thrown away. Laser is rapidly becoming a more preferred treatment as of late and for good reason, because after several treatments many people would be able to claim to be (practically) hair free. Laser hair removal uses a single wavelength of light to target, heat and damage hair follicles. It can treat large areas, including your back and legs as well as more delicate areas. Most people need 3-6 treatments to get the hair out of ‘growing phase’. It essentially works to destroy hair follicles, reducing the amount and density of the hair that grows back. While going to laser clinics can get costly, handsets are now becoming available in Australia, allowing you to do your treatment from the comfort of your own home. Laser: Laser Clinics are certainly a more environmentally friendly way of removing hair, plus after the initial treatments, the hair removal lasts longer however it can become expensive due to the number of treatments one may need and awkward. 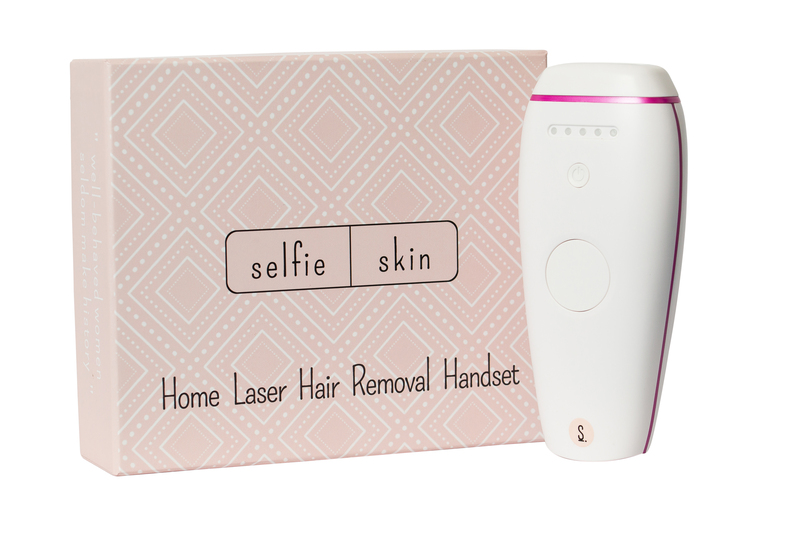 The Selfie Skin IPL Hair Removal Handset is available for $189.99 RRP.